For centuries, artists have used plaster molds to replicate sculptures. More recently, manufacturers have used rubber or plastic to create molds for countless products. A mold enables the creation of multiple replicas – a pattern is repeated, sometimes endlessly. Breaking the Mold — the title of this paper — is an action that’s usually not taken lightly. Yet that is the proposition before the U.S. tech industry as it contemplates its workforce in the 21st century. Across the nation, around the world, advances in technology are the drivers of innovation, opportunities and prosperity. Tech companies spur productivity, make difficult tasks easier and improve lives. They create wealth and provide fulfillment not just for those with the bright ideas, but also for the well-paid workforces that turn the entrepreneurs’ vision and prototypes into products. Yet in a country with a population growing more diverse each day,1 the U.S. tech community is monochromatic, a bastion of white, male privilege. People of color largely remain shut out of the tech industry. It cannot go on this way. The lack of racial diversity in the tech sector is a critical problem demanding investor attention. We already know that a racially diverse tech sector could translate into stronger financial performance for tech companies. Yet tech companies’ efforts to address the lack of racial diversity have not resulted in real change. A growing number of U.S. tech companies have begun releasing annual updates on diversity. These releases typically are accompanied by statements promising change and describing new diversity-related efforts — to the tune of an estimated industry investment in diversity of up to $1.2 billion in the past five years, according to Intel/Dalberg.15 Often, investment comes in the form of money and resources poured into diversifying tech talent pipeline programs at nonprofits and universities. Many companies also have implemented staff training in unconscious bias, as well as employee affinity groups based on race, ethnicity, gender, sexuality, or physical ability — while these are all worthwhile activities, additional efforts are needed to see real change. Diversity is not simply about filling seats at the table. It’s also about the decisions that get made at the table. A racially diverse tech industry helps ensure that the products and services the industry produces meet the diverse needs of the millions of Americans who depend on them. It also helps companies avoid perpetuating racial bias and discrimination, which pose legal, financial and reputational risks for them. Racial diversity is about distributing power and resources equitably, within the industry — and beyond. If the tech industry changed its hiring and promotion practices, the entire economy could benefit. Such a shift would “serve as a catalyst for achieving racial equity” across every industry,18 argues CODE2040, a nonprofit that builds pathways to tech careers for black people and Latinos. In the context of a growing affluence gap in the U.S. — in three decades, the average wealth of white families has grown by 84 percent, 1.2 times the rate for Latino families and three times the rate for black families19 — increasing opportunities for people of color in one of the fastest-growing and highest-paying sectors is a critical step toward redistributing economic opportunity across the economy. Engaging white executives to make change. There is substantial evidence that diversity leads to stronger economic gains for companies, no matter the industry. Given the digital world’s burgeoning social and economic influence, the current lack of racial diversity in the tech industry poses serious risks for investors, the tech sector and society at large. Breaking the Mold aims to give shareholders the facts they need to convince tech companies to take new approaches on racial diversity. In addition to underlining the already well-founded business case for racial diversity, this report will review the systemic problem of racial bias in tech; the failure of existing efforts to effectively address the problem; and the powerful role of investors in holding tech companies accountable for real change. OPEN MIC IS A NONPROFIT ORGANIZATION THAT WORKS TO FOSTER VIBRANT AND DIVERSE MEDIA THROUGH MARKET-BASED SOLUTIONS. OUR PRIMARY TOOL IS SHAREHOLDER ENGAGEMENT. WE AIM TO DEPLOY THE COLLECTIVE POWER OF INVESTMENT MANAGEMENT AND ADVISORY FIRMS, MUTUAL FUND COMPANIES, FOUNDATIONS, PENSION FUNDS AND ADVOCACY GROUPS TO HELP SHAPE CORPORATE MEDIA POLICIES AND PRACTICES. What is the tech industry? What defines a tech company? Which jobs are tech jobs? This report focuses on increasing racial diversity in both technical and nontechnical jobs primarily at publicly traded information technology companies20 – in other words, companies involved in IT; internet software and services; communications equipment; data processing; technology distribution; and related services. However, many high-tech companies – and many high-tech jobs – fall under a broader definition. Companies in the telecommunications, health care and utilities industries, for example, also rely greatly on technology and technical jobs. The 2016 Diversity in High Tech21 report by the U.S. Equal Employment Opportunity Commission (EEOC), which is cited throughout this report, defines the high-tech sector as comprising “industries that employ a high concentration of employees in science, technology, engineering and mathematics (STEM) occupations and the production of goods and services advancing the use of electronic and computer-based production methods.” The EEOC definition considers an industry high-tech if “technology-oriented workers” account for at least one-quarter of the total jobs within the industry. The EEOC findings are based on 2014 EEO-1 reports filed by private U.S. companies within these high-tech industries. Intel and Dalberg Global Development Advisors, whose research on the economic value of racial and gender diversity in tech is also cited throughout this report, conducted an analysis of almost 170 U.S. based tech companies and applied the results to the nearly 500 domestic-tech companies listed on the NASDAQ22 to estimate industry-wide economic effects of diversity on revenues, market value and operating margin. The NASDAQ Composite index includes shares of firms specializing in computer services, internet services, software and hardware manufacturing and distribution, office equipment manufacturers and distributers, semiconductors and telecommunications equipment. Racial diversity requires an explicit focus from investors and companies. Many tech companies have begun to disclose the breakdown of their employees by gender and race. As a result, we have more than enough evidence showing that the industry is vastly and disproportionately composed of white men. Gender bias and racial bias are fundamental issues for these companies to address. The issue of inadequate racial diversity, however, often takes a back seat to discussion of inadequate gender diversity. 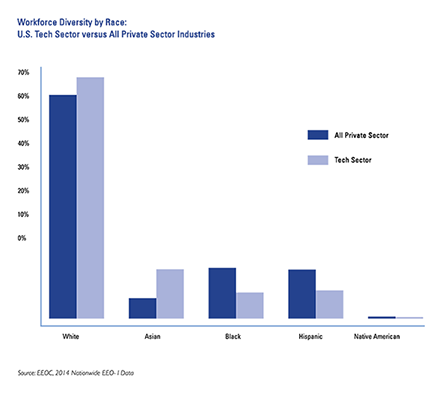 Racial diversity significantly strengthens economic outcomes for tech companies and tech investors. People of color in leadership and decision making roles at all levels can help ensure that the products and services built by the tech industry: 1) meet the needs of a diverse consumer base; and 2) do not perpetuate existing forms of racial bias and discrimination, which pose legal, financial and reputational risks for companies. Because racial bias is a systemic problem, it works against people of color every step of the way, from the talent pipeline to the board of directors. Although some improvement has been made to representation in the tech pipeline25 — thanks in part to effort and expense that tech companies have devoted to opening the spigot — this improvement is not yet reflected in companies’ workforces. *Companies determine how they disclose their data. 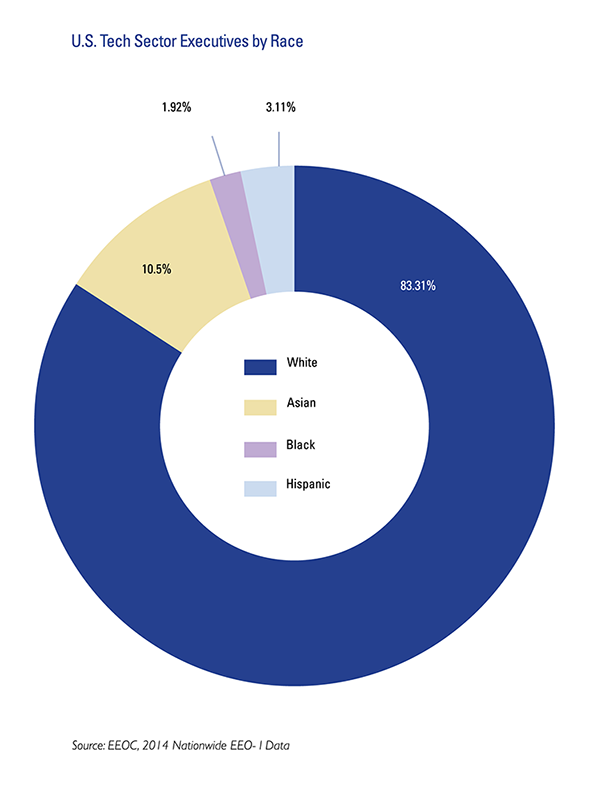 The categories above reflect commonly reported racial categories: white, black, Asian and Latino. “Other” indicates additional categories reported on by companies, including but not limited to: Native American, Native Hawaiian/Pacific Islander, Alaska Native or multiracial. Most companies do not aggregate gender and race data. *** Apple’s retail employee base is included in its overall numbers. In 2014, Apple had about 66,000 employees in the U.S., including 30,000 U.S. retail employees.30 According to the company’s latest disclosure, the retail staff is more racially diverse than the staff overall. Meanwhile, the tech staff is less racially diverse than the staff overall. **** Oracle does not publicly break out percentages of white, black or African-American, Asian, Hispanic or Latino staff employed by the company. Oracle’s disclosure states that employees include 37% minority staff and 29% women staff. Under pressure from diversity advocates, watchdogs and investors, many tech companies have taken the critical first step of publicly disclosing the racial makeup of their staff and leadership. Beyond increasing transparency, they are striving to change company cultures, implement anti-bias training and require racially diverse candidate pools. These are important steps toward change. More than a dozen big, publicly held tech companies now disclose annually the employee diversity data that the U.S. Equal Employment Opportunity Commission (EEOC) requires. These “EEO-1 reports” include information about the gender and race of staff, broken down by job categories delineated by the government. Notably among these well-known companies, IBM has not disclosed its EEO-1. 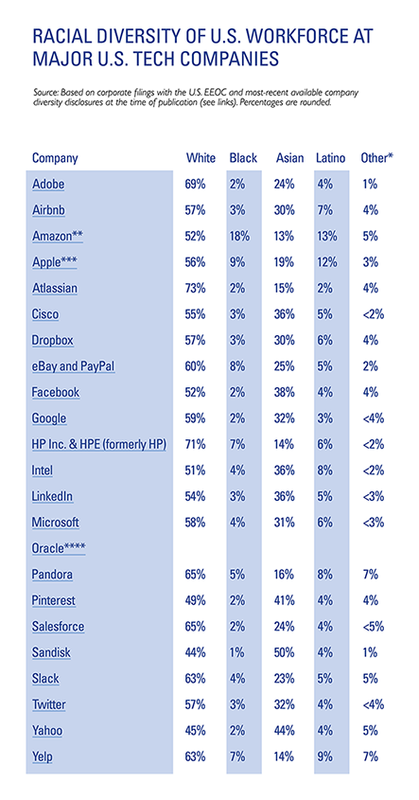 The table below is based on an EEOC analysis of 2014 employee demographic data from major U.S. tech-sector companies. In the San Francisco Bay area’s tech landscape, black people and Latinos had “negligible employment representation” in 2014, according to the EEOC. People of color are largely excluded from leadership positions in tech. White hands remain firmly gripped on the levers of power. For example, fewer than 1 percent of Silicon Valley executives and managers are black, according to the EEOC. FOR PEOPLE OF COLOR, THE “RIGHT” EDUCATION AND CREDENTIALS ARE NO GUARANTEE OF A JOB. AT THE SAME TIME COMPANIES WORK TO ADDRESS BIAS IN THE TALENT PIPELINE, THEY CAN ADDRESS BIAS IN THEIR OWN RANKS. In response to low levels of racial diversity, companies often point to the need to diversify the talent pipeline. But statistics show the pipeline isn’t the only problem. Google, for example, has placed engineers at a handful of Historically Black Colleges and Universities (HBCUs) to teach computer science and to coach students on applying and interviewing for tech jobs. In 2015, the company donated $775,000 to CODE2040 for its work to increase representation of black people and Latinos in tech. Tech companies must do better at hiring people of color in technical roles. At the same time, there is no justification for the lack of diversity in non-technical roles. From lawyers and public relations staff to sales and marketing employees, a range of well-paid roles are required to keep a tech company alive and well. Just as companies in the public sector overall have managed to increase diversity across a variety of job functions, there is no reason tech companies can’t do the same. For people of color, the “right” education and credentials are no guarantee of a job. At the same time companies work to address bias in the talent pipeline, they can address bias in their own ranks. Poor retention is a big part of the problem. Stereotypes and racial bias run deep. Women and people of color encounter negative workplace experiences far more often than their male and white counterparts. “Gender and racial bias is so ubiquitous in the technology industry that it forces talented female and minority employees to leave,”42 says Bonnie Marcus, an executive coach for women. Women of color face unique and additional barriers. All women are underrepresented in the tech workforce, but black, Latina and Native American women lead this deficit. The lack of racial diversity in the tech industry is a persistent problem, not a new one. Why? One explanation for the disparity between available candidates and their representation in the workforce: implicit or unconscious bias among the mostly white men who call the shots. Importantly, many companies are implementing anti-bias training to help staff identify and address unconscious racial bias in the workplace. In the past, companies working to increase diversity have often relied on “diversity trainings”, which do not necessarily include a focus on systemic bias. However, it is not clear that all diversity training works. One study found that “[p]rograms that target managerial stereotyping through education and feedback (diversity training and diversity evaluations) are not followed by increases in diversity.”55 Moving forward, companies should work to assess the effectiveness of any form of training they implement for staff — whether anti-bias training or otherwise. Hiring and promotion practices often impede potential recruits. Language in tech-sector job listings often reinforces white, male cultural norms. Ensuring that both the hiring committee and the channels for finding candidates are diverse in terms of race, gender, class, age, location and ability. Implementing anonymous hiring tools that allow companies to screen candidates without being presented with personally identifying information such as name, graduation years, photos, etc. Avoiding “whiteboard interviews,” which have been called “behavioral screening[s] in disguise.”60 Candidates are often asked to recall algorithms from memory and under time pressure, triggering stereotype threat61 for underrepresented candidates without testing actual job functions. Asking every applicant the same interview questions. Greater effort is required to retain employees of color once they’ve been hired. Mentorship is an important part of feeling supported at work, yet mentorship alone is not enough for people of color to be able to contribute to shaping the tech environment. Employee Resource Groups (ERGs) bring employees together based on affinity around race, gender, physical ability, sexuality, nationality, and other identities. More often than not, these groups are developed for staff to connect and build networks around marginalized identities. However, systemic change requires action and participation from the dominant groups as well as those experiencing marginalization. Tech’s influence on the U.S. economy may outstrip even its accelerating innovations and profits. One reason investors should care about racial diversity is because it is good business. Tech companies in the top 10% of racial/ethnic diversity are roughly two-thirds more likely to produce higher revenues than those in the bottom 10%. Similarly, companies that lack racial/ethnic diversity are about 20% more likely to fall short of median operating margins. Racial diversity is about the distribution of power. Increasing racial diversity in tech does more than increase the representation of people of color. It also distributes power and resources equitably, within the industry — and beyond — for a stronger economy. Tech companies are setting the standards and rules for society. Without people of color making decisions that shape these rules, companies risk perpetuating racial bias and discrimination, which harms consumers, damages business reputation and can lower profit. At the same time, social media platforms such as Twitter, Facebook and Instagram provide a way for marginalized communities to share information and organize to call out racial injustice. But as citizens use tech platforms to capture footage of police killings of black people, for example, the role of determining how, when and whether to censor users’ content remains under the tech companies’ control. Despite all the evidence demonstrating its benefits, many tech investors don’t prioritize company diversity in their funding decisions. What does investor commitment to racial diversity look like now? “Many VCs don’t seem to care about the problems they create, how founders perceive them, and the lack of diversity in funding practices,”74 says Ellen Pao, an investment executive and a co-founder of Project Include. SOME INVESTORS ARE REQUESTING MORE SPECIFIC DIVERSITY POLICIES AND PRACTICES AT COMPANIES. In 2015, Arjuna Capital began asking tech giants to disclose the wages of their employees broken down by gender. A new EEOC requirement for larger companies to disclose employee compensation data, starting with 2017 EEO-1 reports, should shed more light on pay inequities. In 2015, Apple shareholder Tony Maldonado submitted a proposal asking the company to adopt an “accelerated recruitment policy” to increase representation of people of color among Apple’s leadership. The proposal garnered widespread media coverage and won 5.1 percent of the shareholder vote. Mr. Maldonado and co-filer Zevin Asset Management have filed a similar proposal for consideration at Apple’s 2017 annual meeting. After Black Enterprise in 2014 published a “list of shame” of tech companies without a single black director,82 the Nathan Cummings Foundation prodded 13 tech companies to improve the racial diversity of their boards. It also asked them to devise plans to broaden black representation in each company’s “contractor relationships and the workforce more broadly.” By 2016, only three of the targeted companies had appointed a black person to their corporate board. For investors, disclosure and transparency by companies are often critical to identifying the changes that must occur there. But such openness is still limited. One limitation is the overall lack of data aggregated by gender and race. With current disclosures, it is difficult to answer more complex questions such as: How are women of color faring compared with white women, or compared with men of color? Software startup Slack in 2015 found that only 9 percent of U.S. engineering organizations publicly reported the intersection of race and gender in staff diversity reports. COLLECT AND DISCLOSE MORE DETAILED DATA on the workforce, filtered by demographics (both gender and race, aggregated) to help display the specific challenges each company faces related to race and equity. As with any other business challenge, tracking a comprehensive set of metrics can help companies understand whether the efforts in place to address the problem are working, and where additional efforts are needed. DEVELOP AND PUBLICLY DISCLOSE TIME-BOUND GOALS for racial diversity to ensure that tech companies not only make public commitments — they also produce timely outcomes that reflect those commitments. LINK EXECUTIVE COMPENSATION AND EMPLOYEE INCENTIVES TO THE ACHIEVEMENT OF GOALS related to increasing racial diversity, as one way of instilling accountability. ENGAGE WHITE EMPLOYEES — ESPECIALLY EXECUTIVES — IN MAKING CHANGE to help ensure that the responsibility to increase racial diversity falls on those who currently hold the most power and influence, rather than on the tech professionals of color who are most directly affected. Identifying responsibility for holding leaders to achieving time-bound goals is critical. Many experts suggest that when company leadership — especially a CEO or a committee of the board — takes on the responsibility of achieving diversity goals, the company gets better faster. Linking executive compensation to the achievement of responsible investment goals is not a new type of shareholder engagement. Such companies as Verizon, Kraft and Coca-Cola look at the success of diversity initiatives when determining the wages of top managers.99 Groups like Ceres have advocated for this practice for years as a method of increasing both financial gains and nvironmental sustainability in business.100 According to Calvert Investments’ 2013 A Survey of Corporate Diversity Practices of the S&P 100, 42 percent of companies in Standard & Poor’s 100 Index tied executive compensation to diversity goals.101 A 2014 report102 on corporate diversity by U.S. Sen. Robert Menendez found that about half of Fortune 100 companies surveyed (55.4%) tied performance on meeting diversity goals to a portion of executive compensation. Among tech companies, the practice is becoming more common. Without real commitment to change from white executives who currently hold disproportionate power in tech companies, diversity and inclusion efforts can fall short. Investors have a unique opportunity to push tech companies to change. Diversity efforts can be most effective when they move beyond reacting to the lack of diversity and toward creating an alternative multiracial environment that works for all. Crossroads Antiracism Organizing & Training, an organization providing organizing, training and consulting to institutions striving to dismantle racism, developed a Continuum on Becoming an Anti-Racist Multicultural Organization106 that lays the groundwork for evaluating an institution and moving it from being exclusionary and “monocultural” to becoming an “anti- racist, multicultural” one. The U.S. tech sector creates products and services that increasingly shape our lives, our economy and our democracy. Yet too many companies in the sector – often bold, innovative and profitable firms – find their systems for recruiting and retaining human capital infected by racial bias. The unfortunate reality is that tech companies provide disproportionate access and opportunity to white men at the exclusion of women and people of color, and to the detriment of society and the economy. The challenge – for an industry that usually welcomes challenges – is to transform the workplace into one that works for everyone. It can be done. For those leading the way to improve racial diversity, persistence is a critical part of the strategy. Bringing about systemic change requires re-evaluating and disrupting currently accepted policies, practices and behaviors. Fortunately, some stakeholders have begun to build frameworks that could shape a more open and responsible future. But there’s a lot of work to do. Open MIC urges you to weigh the data in this report. Listen to the voices. Investors, tech professionals, budding entrepreneurs, consumers — all have a stake in creating a racially diverse tech industry. It’s time to break the mold. People of color in tech are leading the way by providing a path forward. The organizations listed below are among many groups leveraging the expertise of people of color to shed light on the issue and to make the industry racially diverse. This list is only a sampling, and is not meant to be comprehensive. 20/20 SHIFT exists to help tech and digital media companies diversify their recruitment process, retain minority talent and provide leadership and skills-based training to the industry’s next leaders. BLACK FOUNDERS works to increase the number of successful black entrepreneurs in technology. BLENDOOR is a blind recruiting application that hides candidates’ name, photo, and dates to mitigate unconscious bias in hiring. Blendoor uses data-driven technology to enable companies to make better hiring decisions based on merit, not molds. CODE2040 creates access, awareness and opportunities for top black and Latino/Latina engineering talent to ensure their leadership in the innovation economy. /DEV/COLOR seeks to create self-sustaining systems that help black software engineers grow their impact. DIGITAL UNDIVIDED trains and supports black women and Latina entrepreneurs. Founder Kathryn Finney is also a partner in the Harriet Fund and co-founder of the HARRIET ANGELS SYNDICATE, both of which focus on startup support for black women and Latina entrepreneurs. GOOD FOR POC is a survey that can be filled out by people of color working at tech companies. It’s meant to be a measure of how people of color in the tech industry are treated/feel included at the companies they work for. The goal is to provide an anonymous and safe space for people of color to share their experiences at the companies they work for. LEVEL PLAYING FIELD INSTITUTE (LPFI) is a project of the KAPOR CENTER FOR SOCIAL IMPACT, which aims to make the technology ecosystem and entrepreneurship more diverse and inclusive. PROJECT INCLUDE is an open community working on diversity and inclusion solutions for tech companies. It is led by tech leaders Erica Joy Baker, bethanye McKinney Blount, Tracy Chou, Laura I. Gómez, Y-Vonne Hutchinson, Freada Kapor Klein, Ellen Pao and Susan Wu. The group has developed a list of seven top RECOMMENDATIONS for tech industry leaders seeking real change. SM Diversity: specializes in helping companies attract talent from underrepresented gender, race and ethnically diverse communities to drive innovation, teamwork, and bottom-line results. THE TECH CONNECTION is a recruitment platform that supports the professional development of untapped technical talent. It offers individualized career planning and job placement to candidates. THE TECHSTARS FOUNDATION is a networking and grant-making organization for organizations seeking to improve diversity in tech entrepreneurship. The foundation, founded in 2015, awards grants up to $50,000. TECHUP connects diverse tech talent with companies that believe diversity is an advantage, and that inclusive teams are stronger, smarter and better.